Citing people familiar with the plans, Re/Code is reporting that Facebook and Apple have failed to agree on terms regarding Facebook’s upcoming subscription tool, which is why it will not be available to iOS users and will only be launched on Android phones. Apple wants to take as much as 30% of any subscription revenue Facebook helps generate, whereas the social networking giant wants all of the money to go to publishers. Facebook wants to help media companies sell subscriptions with the help of its new subscription tool, that will put paywalls around some articles in Facebook’s news feed, and then send users to publishers’ sites to buy subscriptions. 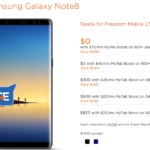 The company has previously said it won’t take any of the money publishers generate from subscription sales, and won’t capture customer data generated in the transaction. Apple however, does not seem to agree with this model. The hang-up with Apple stems from the company’s rules about subscriptions sold inside apps on its iOS platform. Apple takes a cut of up to 30 percent of subscription revenue from “in app” sales. And even though Facebook’s plan calls for users to sign up for subscriptions outside of its apps, on publishers’ individual web sites, Apple officials consider that an “in-app” purchase, since the impetus for the transaction kicked off inside Facebook’s app. People familiar with Facebook’s plans say Google won’t take a cut of subscriptions users sign up for using its Android operating system. 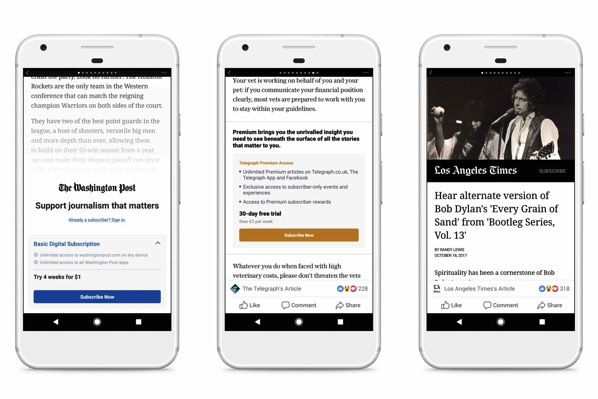 Facebook will now be rolling out a version of the subscription tool that will work on Android phones in the next few weeks, which it says will work with publishers including the Washington Post, Hearst and Tronc.